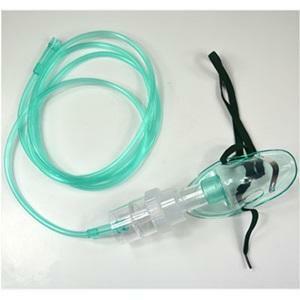 Nebuliser Kit-Paediatric Elongated Mask 6ml Nebuliser Jar. Nebuliser Mask, Bowl and Connector Tubing. A Nebuliser is a device used to administer medication to people in the form of a liquid mist to the airways. It is commonly used in treating cystic fibrosis, asthma, and other respiratory diseases. A nebuliser is a machine that uses compressed air to deliver asthma medicine as wet aerosol, a mist that can be inhaled. The most common medications used in a nebuliser are bronchodilators to help open up air passages such as VENTOLINE and IPRATROPIUM.